We’ve been having a very quiet Christmas holiday. The girls had school until Friday, Dec. 23, and they have the two weeks following Christmas off of school. Since we don’t have family close by, and since we haven’t get developed relationships here with friends who will become like family, we had Christmas with just the four of us. We opened up just a few presents on Christmas Eve, and we didn’t start opening the rest of the presents until Christmas Day afternoon. Even then, we only opened up a few at a time. The girls opened a few gifts and found stuff they wanted to play with, so we let them enjoy their gifts rather than forcing them to open up more Right Now. It ended up that we didn’t finish opening presents until two days after Christmas! We had a fellow pastor’s family over for supper on Wednesday evening, and we had another single friend over on Thursday evening, but other than that, we haven’t done any entertaining. It’s been nice to relax and just take it easy. It would be nice to have people to get together with, too, but I’m sure there will be Christmases in the future where we have more people around. For now, it was nice to have a quiet Christmas. I married a good man. A very good man. I married a man who claims to like how I look without makeup better than how I look with makeup. We have now been married for over eleven years, and he continues to make this claim over and over again, so I guess I should believe him. For the most part, I do believe him. And it’s easy for me to not wear makeup. That’s how I grew up. I always had horrible acne during my teenage years, so makeup was discouraged by my doctor. During those teenage years, I started to notice the girls in school who did wear lots of makeup versus those that did not, and it was often true that those girls who wore a lot of makeup also had personality traits that I didn’t admire. Those traits weren’t necessarily bad traits, although sometimes they were, but mostly I didn’t like the idea covering up who I really was. I wanted to be someone who could walk out of the house without her makeup on and still feel okay about myself. The last major makeup purchase I did was for my wedding. I did that because … it was my wedding! In the year before that big event, I went to a Mary Kay party, and the consultant was very sweet and kind and helpful to me as I chose the various beautifying agents for my Big Day. Although, somehow, I completely neglected to buy lipstick for my wedding. I have no idea how this happened. All I know is that the morning of my wedding, I raced off to some local drugstore and bought lipstick off the shelf. It was Very, Very Pink. Too much so. When the moment finally arrived to apply the lipstick, and I put it on and knew it didn’t look right, but at that point it was too late. Alas, I still notice my garishly pink lips on my wedding pictures, and it’s one of those things that, if I could go back and do it over, I would do that differently. So, outside of a lip gloss purchase here or there (my favorite is Burt’s Bees in Rhubarb), I did not purchase any makeup at all since that momentous occasion. At least, not until this week! So, here I am, in my mid-thirties, having arrived at our new church with the mantle of Experience resting on my shoulders. I am feeling, finally, grown-up. I got to thinking that perhaps I should give this makeup thing another try. I had thrown out all of my old wedding makeup when we moved; somehow I thought that after eleven years, it probably wouldn’t be good to use anymore. Over a number of weeks, I noticed various makeup coupons in the coupon section of my Sunday paper, and I’ve been cutting them out. Finally, I decided it was time, and I went to my local store with the big red bulls-eye on it and spent some time in the makeup section. There were three other ladies in the aisle, all quite elderly, and none of them shopping together. I felt distinctly out of place, and wondered what I was doing there. I thought that perhaps I was still too young to be wearing makeup. But, I finally managed to select the following: mascara, eyeliner, lipstick, foundation, blush, eyeshadow. But, I think I’m going to have to adjust my application method for the eyeliner, at least. It’s too bad I have practically no knowledge of how to do any of this makeup stuff. I wonder if I’ll ever be able to conquer eyeshadow! First of all, Happy Reformation Day! Thank God for good ol’ Marty Luther who defied the largest religious institution of his day and said that you didn’t have to buy indulgences or work hard at being a super-good person or become a monk or a nun to get to heaven. Thank you, God, for Luther! And, even if you’re not a Christian, you can’t help but acknowledge how Luther’s actions changed the course of history. Quite a guy, ol’ Marty was. We had a big Reformation service at church yesterday. It was awesome! I love me a good church service with big organ, choir and lots of brass. Dah-da-da-daaah! Always good to sing “A Mighty Fortress Is Our God.” In the regular Sunday morning service, we sant that hymn, too, but we used the old words: “A mighty fortress is our God, a bulwark never failing…” That was a nice change of pace. Here’s a link to our Reformation service yesterday, if you’re interested. The sermon was amazing! The pastor who preached is one of the best preachers I have ever heard. He preached on Daniel in the Lion’s Den, and it was SO good! I’ve heard this pastor preach more than once, and he has knocked it out of the ball park every time. Also connected to this link are videos of all of the presentations given at the SoWE. You can see my hubby talk about Enhancing the Liturgical Year, if you’re interested. All of the consultants’ presentations were interesting; they’re all experts in their fields as well as good speakers. Check their presentations out! This weekend our congregation hosts the AZ-CA district teachers’ convention. It’s just one big thing after another around here! I’m somewhat involved in that, but not much. Mostly I’m helping out with meals, although there is a service in the late afternoon on Thursday for which my hubby is preaching and for which I am singing a few things. (It’s going to be the same Compline service JJ did for the SoWE on Saturday night, so if you’d like to watch it, click here. He preached on All Saints Day.) It will be nice to see some friends again in connection with that, including AM, who is staying with us. Hooray! After convention, life *should* slow down for our family (aka. JJ). Although, we’re heading into the holiday season, so I don’t know how much it will actually slow down. But, theoretically, it seems like it will. There will be less extra stuff on the docket, which will be good. One curtain rod and curtains are put up. Yay! All of the other curtain rods and curtains have been purchased, and are now just waiting to be installed as well. That’s good. All of the shades and blinds were professionally installed a week ago (ABSOLUTELY worth the money! ), so now we finally have a little privacy in our house. It definitely gives the house a different feel! Slowly, the house is coming together. Pictures are starting to appear on walls. Curtains are going up. It’s starting to feel a little more like … a real home. And tomorrow is November! How did this happen? JJ got safely home last night after being gone for a week. Of all the trips he’s had over the past few years where I’ve had to play single mom, this one was one of the longest. Thankfully, everything went very well. I had no anxiety attacks (yay! ), the girls and I did fine, and I made time and opportunity to invite a few people over for meals a couple of times. It was kinda fun to be totally on my own! The other big thing I did while JJ was gone was to paint an accent wall in our bedroom. 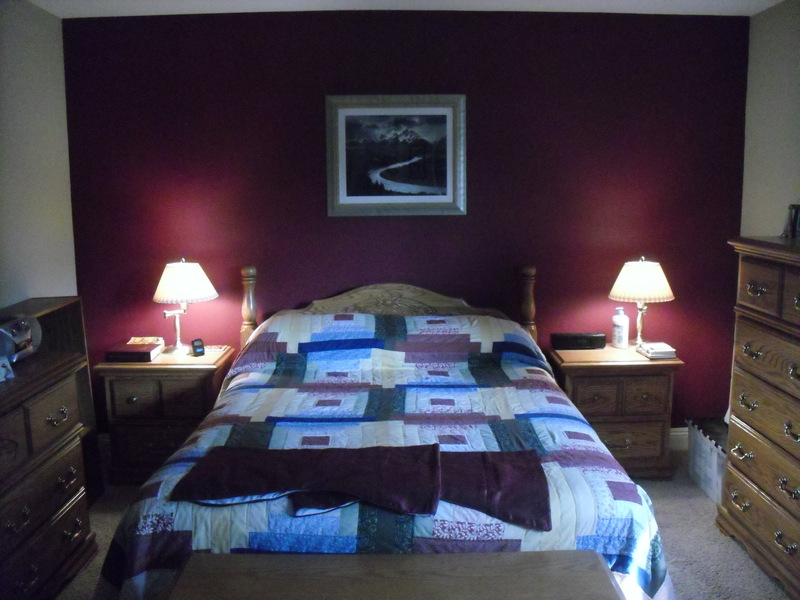 JJ and I had talked about this in the weeks before he left, and we had agreed which wall we wanted to paint, and we agreed on a general color: burgandy red. However, before JJ even left, I decided that I would pain that wall while he was gone as a surprise for him. So, he left on Thursday morning, and that afternoon, Jujubee and I were at H0me Dep0t, bedroom curtains in tow, browsing through paint chips. I considered getting a paint sample and trying it on the wall before actually buying an entire gallon, but in the end I made a choice and went for it. I picked a lovely dark burgandy red, called “Antique Ruby.” But, when I saw the actual paint in the can, I told the paint-mixer-upper-guy, “This is … pink.” He assured me that when it dried on the wall, it would look red. After bringing the can of (pink? kind of purple-y?) paint home, I single-handedly moved our queen bed away from the wall about two feet. I moved the other pieces of furniture out of the way. I taped the edges of the wall and ceiling, removed the wall outlet covers, and spread the drop cloths over the carpet. All was ready for the next morning’s painting. Friday morning, after getting the girls off to school, I dived right in and got one coat of paint on the wall. As I put it on with my roller, it looked very purpley-pink. “Well,” I said to myself, “the guy said it would dry red.” And, lo and behold, it did! It sill had a hint of purple in it, but the red tones definitely showed through. So, then I agonized for a few days; do I sponge-paint a lighter color over it? I brought it a few other people to get their opinions on it, and everyone said it looked great the way it was. Most people said that, when the color was looked at next to the curtains and the bedspread, it looked better than the color I had picked out! In the end, I left it as it was. I got all the furniture moved back, and I even got the bedskirt put on (with a little help from some friends). When JJ came home last night, he was very surprised, but very pleased with the end result. So, yay! He liked it! I’ve never done any kind of painting project on my own before, so this was pretty exciting for me. I’m glad the end result turned out so well. PICTURES! The fabric at the bottom of the bed are the curtains I bought for the window, and I tried to match the wall color to them. 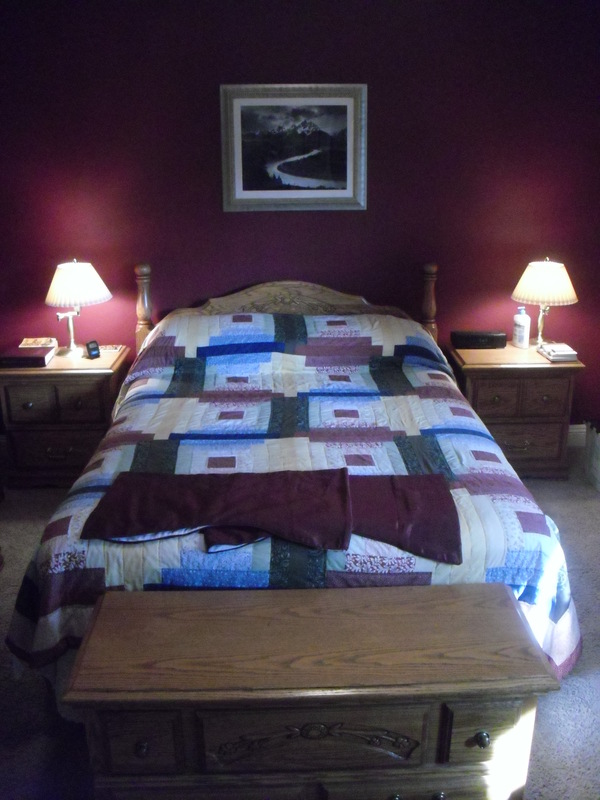 The picture above our bed is an Ansel Adams photograph of the Grand Teton Mountains with the Snake River running below. I think that corner of the world is the most beautiful place I’ve ever seen. Lyd’s had a baby tooth that has been loose for months. It’s been on the top of her mouth, just to the left of her front teeth. The grown-up tooth came in behind, but that baby tooth refused to let go. It’s been very loose, so loose that I could even feel the bottom of the tooth, but even when I grabbed it by the top and bottom with a tweezers and really pulled, it still refused to come out. It was hurting her, so much so that she wasn’t often eating on that side of her mouth. Our new church has a dentist in the congregation. He’s actually a prominent member, and I heard he gives discounts to church members, so I made an appointment for Lyd to see him. That tooth needed to go! After a minute, when her mouth was good and numb, the dentist brought out a large silver extractor-thingie with a handle the size of a wrench, but a very small end. One good tug from the dentist, and that tooth was out. Lyd could hardly believe it was over, and since she was all numb, she never felt a thing. For some reason, her tooth had been held on by some thick tissue. It sure was thick, because once that tooth was out, it bled and bled, much more than I’ve ever seen a tooth bleed. But, it was out, and that was the important thing. I couldn’t believe how far the adult tooth underneath had already pushed through – it was almost completely done coming out, almost as much as her front top teeth! There was absolutely no hole for her to run her tongue around in! No surprise, it felt strange to Lyd to have her mouth numbed, but overall she did really well. In the dentist’s waiting area, there were some handmade hair bows for sale, apparently made by the office manager. So, I told her that she could pick out her gift from the tooth fairy for being such a brave girl. She picked out two matching pink bows with cute sparkly pink buttons in the middle. The dentist, the assistant, and I all told Lyd that she was a very brave girl, but she didn’t seem to want to hear that and got rather pouty when we complimented. I guess that in the middle of the experience, those compliments were too much for. But this evening after supper, as Lyd and Jujubee were doing their nightly playing out in the backyard courtesy of the Delta Breeze and the cooler temperatures, Jujubee poked her head back in the house to tell me, “Lyd was very brave today when the dentist pulled out her tooth!” Lyd was standing right there, and she smiled proudly at her little sister’s compliment, and then happily raced off to run around some more. So, apparently, it was a good experience. Three summers ago, my husband, JJ, attended WELStock while I stayed at home with Lyd and Jujubee, who was just nine months old at the time. Long-time blog readers might remember reading this post, written as I tried to be okay with the fact that JJ was at WELStock and I was at home single parenting a four year old and a nursing baby. When JJ returned home from that WELStock, he said that he felt wrong being there without me. “It just wasn’t the same without you,” he said. “I knew how much you would have enjoyed sharing what I was doing.” My husband then said that he couldn’t go there without me again, and that we would find a way to make it work for us both to go the next time the conference happened in 2011. And, this past July, we did. The girls stayed with my parents for a week while JJ and I had our first experience with both of us being away from our girls for more than 24 hours. We were away from the girls from Sunday morning to Friday evening, so about six days. It felt strange to be away from them at first, but in all honesty, I didn’t miss them. We were very busy and occupied at WELStock, and there were no reminders of our children, outside of our daily phone calls and the two letters I took time to write to them. JJ and I had a marvelous time at WELStock. We sang in the opening Festival Choir together, lived in a dorm room together, ate all our meals in the cafeteria, and had a wonderful time. We saw SO many people that we hadn’t seen in years, some of them ten or more years! We experienced the highest heat index that that corner of Minnesota had ever experienced. It was SO hot and SO humid outside that the dew point reached 83! I posed the question to my husband that since there was so much water in the air, could a person be baptized just by the words of baptism being spoken as a person walked through the air? 😉 But the extreme heat ended up being part of the fun experience, so in the end, we didn’t really mind it. Although if our dorm hadn’t been air-conditioned, we might have minded it more! It was just absolutely wonderful to be there. To say that “It was so much fun!” – which it was – is a big understatement. The twice-daily worship services were wonderful, as well as a much-needed boost for my faith. The presentations were wonderful. The fellowship was wonderful. It was just all wonderful! Sadly, all good things must come to an end, and WELStock was no exception. So, after that huge mountain-top experience, we returned to our girls, and as a reunited family, began our annual two weeks of vacation in Wisconsin. It was difficult to come back to real life after the worship conference, but at least we didn’t have to return to “real” real life right away – we still had two weeks to take it easy. During those two weeks, we were blessed to have two more social outings without the girls. Both of them were essentially double dates with other pastors and their wives, and oh, did we have fun! We also had a good time visiting with family and friends, as we do every year. It’s never enough time to truly catch up, but we’re thankful for the moments we had. We went to Bay Beach in Green Bay, to the Betty Brinn Children’s Museum in downtown Milwaukee, the Mitchell Park Domes in Milwaukee, and other smaller but still lots of fun events. I’m so glad, however, that my husband and I were able to attend the worship conference together. It made memories that will last a long time. 1) This link takes you to the opening hymn of the Festival Concert in which JJ and I sang. It was an arrangement of “Let Children Hear the Mighty Deeds,” which was the theme of the convention. You can see JJ standing at the far right side of the screen; he’s the last person in the second row from the back. I’m smack dab in the middle of the choir, third row up; find the two trumpeters furthest to the left, go straight up on your screen to the third row, and that’s me. The composer/arranger of this hymn was in attendance, and JJ and I complimented him after the concert on his arrangement. I said, “The orchestral part sounds a bit like Imperial March from the Star Wars movies,” and the composer said, “You’re right – I used John Williams as my inspiration for this piece.” I was tickled that I inadvertently caught on to that. 2) This link takes you to an arrangement of the hymn “Crown Him with Many Crowns” that came later in the opening Festival Concert (notice the darker windows.) If you watch to the end of this arrangement, you will get a feel for how high the ceiling was in this chapel. The acoustics were amazing! 3) This link takes you to the Thursday morning worship service that was held at MLC. Thursday morning they demonstrated Easter Sunday morning worship. All of the services were from Holy Week this year. Wednesday morning was Palm Sunday, Wednesday evening was Maundy Thursday, Thurs morn was Easter Sunday, Thurs eve was Easter evening, and Friday morning was the fourth sunday after Easter, which is always Good Shepherd Sunday. The Thursday services were held at Martin Luther College. The reason for that was because last year, MLC finally completed a long-planned-for new chapel project. Since St. Peter, MN is only about 45 minutes away from New Ulm, MN, the Thursday activities of the conference were held at MLC so that we could see the new facility. It’s beautiful! 4) This link is the evening service at MLC. The organist did some pretty funky music that I’m not sure I would go for. But it was still cool. 🙂 It’s also about one hour and 45 minutes long, just so you know. 7) This link is also from the closing Hymn Festival concert. The entire 1000+ congregation (of all musicians and singers!) was given a copy of the score to Handel’s “Hallelujah Chorus” in our festival materials. It was a sing-along, so we all stood up and sang our hearts out – what fun! 8 ) And finally, this link is the last hymn of the closing Hymn Festival concert: “Jerusalem the Golden,” done with the most beautiful arrangement. It think I was tearing up already by the second line. But I know I wasn’t the only one! On this link, you can see a woman in the lower left-hand corner also wiping her eyes. My cousin’s girl was in the Honors Choir, and she said that she was unprepared for the emotion that everyone experienced singing that hymn. It’s certainly a hymn that gets more meaningful as one gets older, that’s for sure! I can’t wait for the eternal “WELStock” of heaven, where we’ll get to experience Jerusalem the Golden for real! A conference like this is just a little foretaste of the joy to come. Until then, here’s hoping JJ and I can go again in 3 years!